First day of classes at the University of Iowa, photo by Phil Roeder via Flickr. University of Iowa graduate students have the amazing opportunity to experience college in a whole new way compared to their undergraduate years. No longer a wide-eyed, naive freshman, you know what to expect and how to navigate all the twists and turns that come with college. Considering that you’ve made it this far in your academic career, you likely have an efficient daily routine, established study habits, and a good grip on time management. Wiser, older, and smarter, you have things figured out! Still, you also know that college burnout is real, and keeping up a social life while managing graduate school is tough. One of the best ways to establish a balance between school and social life is to join a student organization. We’ve gathered all the information you need to find and join the perfect organization. The organizations we highlight are focused on graduate student interests and will connect you with other students at your same academic level. These involvement opportunities allow you to connect with the community, be a leader among your peers, participate in recreational activities, and be a part of campus events. There are about 100 student organizations at the University of Iowa (UI) specifically for graduate students. This impressive selection ensures that graduate students will feel connected to the university despite the independent nature of many graduate programs. We’ve highlighted a few of the organizations below to give you an idea of what your options look like. The UI Division of Student Life offers an amazing tool on their website called OrgSync that allows you to search all 100 organizations. The College of Nursing Association of Graduate Nursing Students (AGNS) is a space for graduate students to voice their opinions and ideas related to their experience at UI and their position as future leaders of the nursing profession. AGNS also nominates student representatives to serve on the College of Nursing Academic Council and on the University Graduate Student Senate. AGNS membership is automatic for all MSN, DNP, and Ph.D. students upon admission to the College of Nursing, but your level of participation is up to you. Your participation will have amazing benefits, like professional development, networking, and social events. Gather with fellow English graduate students at the next Association of Graduate Students in English (AGSE) meeting. AGSE helps students connect with each other and fosters communication between students and the department administration, placing student representatives on departmental committees, and promoting activities aimed at professional development of graduate students. Through these connections, members might meet peers to workshop their creative writing piece or meet a professor to help them with their thesis. The modern generation has made a huge push to encourage women to pursue STEM (science, technology, engineering, and math) careers. Evidence of the movement’s success can be found in groups like the Graduate Women in Science (GWIS) organization, with chapters all over the world, including Iowa City. Their mission is to build a global community to inspire, support, recognize, and empower women in science. Anyone who holds a bachelor’s or higher degree who supports the mission of GWIS is encouraged to join. These are just a few of the organizations graduate students can choose from. Be sure to check out OrgSync to explore more groups on the Division of Student Life website. 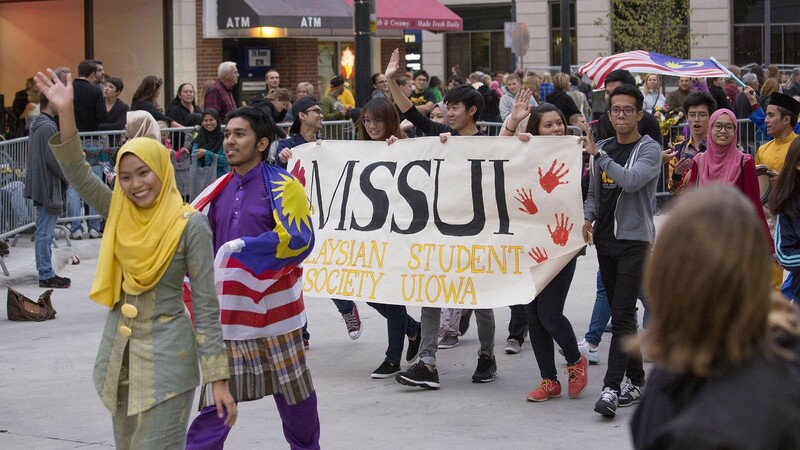 The Malaysian Student Society of the University of Iowa participates in the UI Homecoming Parade. Photo by IowaPipe via Flickr. UI graduate students also have the opportunity to participate in multicultural student organizations. These organizations provide cross-cultural education, leadership opportunities, and cultural enrichment. Many of the multicultural organizations on campus are open to both undergraduate and graduate students. We’ve mentioned a few graduate-focused organizations below. The Society of Black Graduate & Professional Students (BGAPS) serves to create an academic and social environment conducive for successful completion of graduate and professional programs at UI. Their goals include playing a supportive role in helping to increase minority enrollment and retention in graduate and professional programs, and developing academic and social activities that will enhance black graduate and professional students’ quality of life while in Iowa. The Latina/o Graduate Student Association (LGSA) provides support to Latina and Latino students both inside and outside the classroom. They encourage professional collaboration and professional development of Latina/o graduate students while also facilitating a community of social and cultural support for Latina/o graduate students. At meetings, members share and enjoy each others’ cultures over good food, drinks, and music. 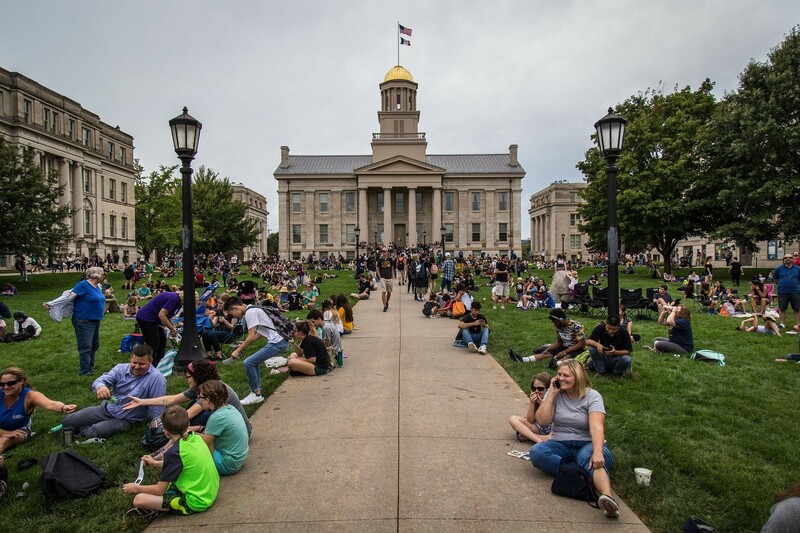 All members are dedicated to meeting the needs of the University of Iowa and surrounding communities, particularly the needs of the Latina/o community. 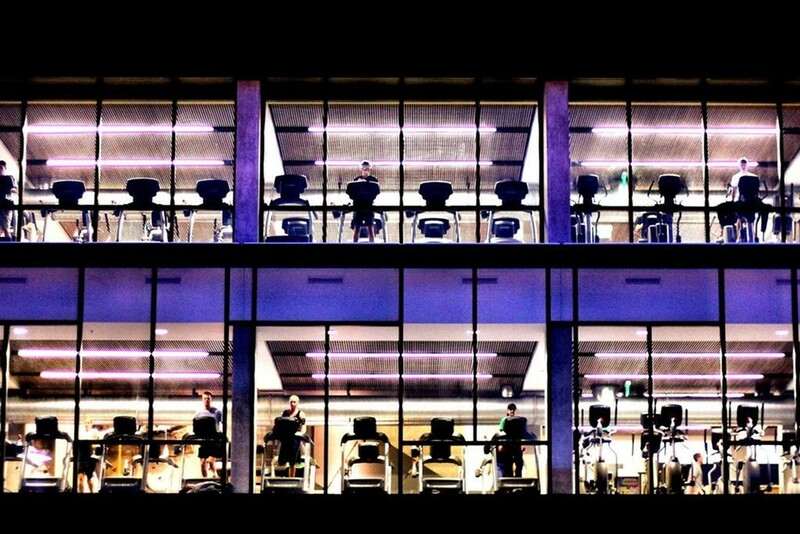 The University of Iowa Campus Recreation and Wellness Center. Photo by Phil Roeder via Flickr. Playing a sport is a great way to build friendships and connections at UI. Intramural sports invite all skill levels, so you don’t need to be super athletic to get involved. Even if you don’t know how to play the sport, there are plenty of students who will teach you. Another option is to get involved in group fitness classes. Details on each of these options are provided below. Intramural sports at the University of Iowa are open to all students, both undergraduate and graduate students. Faculty and staff are also invited to participate. This campus-wide involvement opportunity allows you to get active while playing your favorite sport. 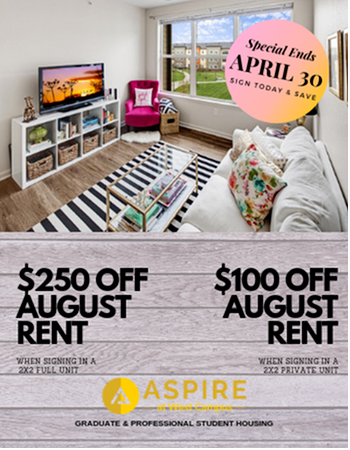 To begin, you need to purchase an intramural sports membership through UI Recreational Services. Then, you can join or create your own team in the sport of your choice. Graduate students can also connect with students in group fitness classes. There are four fitness centers on campus, conveniently located so you can attend a fitness class before or after school. The classes are free with a fitness membership, which is also free for most students. There are nearly 90 classes to choose from, and classes are available throughout the entire school year (including the summer semester). View the group fitness schedule to find out which class works best for you. As you can see, there are plenty of ways to get involved as a graduate student at UI. Student organizations, multicultural organizations, and recreational activities are all available. Pick one or pick a few! You’re far beyond those shy freshman years, and it’s time to branch out. Whatever you decide, you’re sure to feel welcomed at the University of Iowa.